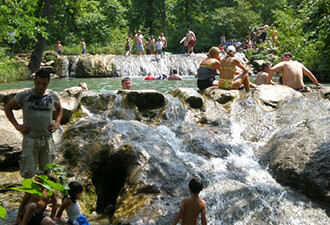 A warm summer day brings many visitors to enjoy the cool waters at Little Niagara, along Travertine Creek. 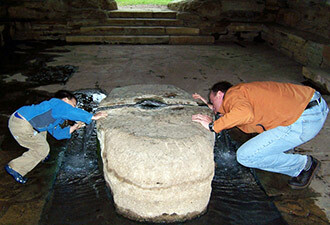 Tasting the mineral waters of Pavilion Springs. Often overlooked, Veterans Lake offers picnicking, swimming, fishing, boating, and excellent sunsets. At Chickasaw National Recreation Area the power of place is evident: cool creeks flowing over travertine terraces; the silhouette of a great blue heron perched on the shore of the Lake of the Arbuckles; families reuniting in historic campgrounds; locals filling jugs with mineral water; and the idyllic escape so many discover here. Lying midway between Oklahoma City and Dallas in part of the country that many stereotype as rather unspectacular subprairie scenery, Chickasaw is a conveniently located contrast. Situated just east of Interstate 35 as it transects south-central Oklahoma at the juncture of the southern Osage Plains and the ancient, worn remnants of the Arbuckle Mountains, Chickasaw entertains more than one million visitors each year. Water defines the park. For over a century, people have come here to enjoy the refreshing, tranquil beauty of this simple wooded valley and its many springs and streams. The reputed healing power of its mineral waters prompted the park’s creation in 1902 as the Sulphur Springs Reservation. The United States Government purchased the land for the new park from the Chickasaw and Choctaw Nations at $20 per acre; making it the first and only national park established at an Indian Tribe’s request. In 1906, the reservation became the nation’s seventh national park, Platt National Park. Visitors flocked to the new park, and many made annual visits a family tradition. In 1908 over 100,000 visitors were counted at Bromide Spring. To conserve the spring water, only one gallon of water per person per day was allowed without a physician’s prescription. Between 1933 and 1940, Civilian Conservation Corps (CCC) members rebuilt Platt National Park. Rustic buildings, swimming holes, and picnic areas, remain today as a testament to their work. Since then, millions have enjoyed the landscape left behind by the CCC by swimming at Little Niagara, camping at the Cold Springs Campground, or tasting the water at Pavilion Springs. After 70 years as the smallest national park, Platt National Park was combined with the Arbuckle Recreation Area to create Chickasaw National Recreation Area. The name of the park honors the vision of the Chickasaw Nation. In many respects the modern park is really two parks in one – the Platt Historic District and the Lake of the Arbuckles. The Lake of the Arbuckles, built in the mid-1960s, offers fun on the water. It’s one of the best fishing lakes in Oklahoma for catfish, perch, bass, and crappie. The Buckhorn and Point campgrounds offer traditional and utility camping sites. 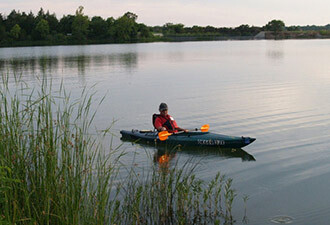 Nearby boat ramps provide easy access to the water's edge, and in areas surrounding the lake some hunting is allowed. In the autumn, the creek-side trails of the Platt Historic District offer an outstanding opportunity to slow down, and exchange the breathtaking vistas and dramatic phenomena of larger national parks, and in their stead delight in quiet, pleasant vignettes of nature's ageless ways. Come visit -- click www.nps.gov/chic/, or call (580) 622-7234.